GIW Industries Inc. developed the diverter-style WBC matrix hydrotransport pump to improve wear life of the suction liner and impeller. The WBC pump increases efficiency, promotes safety, and provides more effective service. With superior suction performance and large sphere passage, WBC pumps are an excellent solution for long-distance pumping. 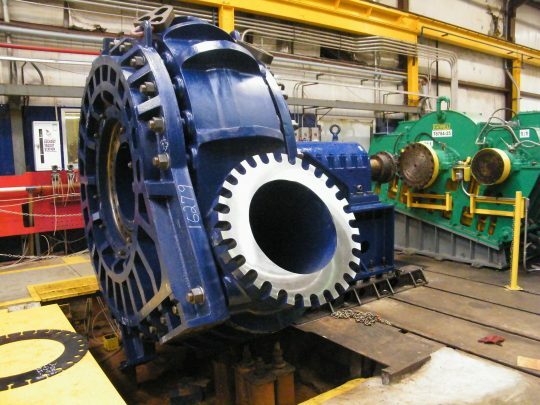 One long-term customer recently upgraded pumps originally installed in the 1960s to GIW’s new diverter-style WBC pumps. GIW’s WBC pumps provided this customer with improved power efficiencies and increased pumping distance between the pumps in series. In addition, the newer pump designs reduce wear and tear — which means the customer’s 40 pumps in the field will last longer. And according to GIW North America Business Development Manager Erkki Kohtanen, the customer is now saving about $550,000 per year. The WBC diverter pump means efficiency, flexibility, and longer lasting wear parts. We’re excited to offer these improvements to our valued customers. GIW has always been committed to innovation, and excellence. Our storied history and successful global customers are proof of our expertise, and we continue to make improvements on our cutting-edge solutions.